If nothing else, that is one thing I've learned over the last several months. You have to take it in stride. 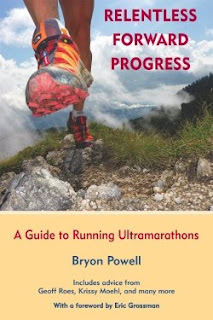 Ultra distance running and the way we adapt to it is so unpredictable. I don't know for sure what caused the realization, and the subsequent adoption of it. But I'm very glad to be where I'm at right now. Injury is tough when you're an active person, particularly for an ultra runner. You can't do what you love to do, and you certainly can't enjoy nearly as much ice cream and Girl Scout cookies while injured...it would make the return to running that much more challenging :) Maybe a big chunk of my ability to handle this go-round in stride is that my goal winter race is finished and now behind me...and I have another 6 months until my next biggie, Leadville. So I don't feel the need to rush anything I guess. I dunno. Something like that. I am back to walking normal, and feel very little pain in the affected area (thanks to some great sports massages, sleeping with my affected leg elevated every night since, wearing a compression sleeve daily, icing, and an arsenal of PT exercises performed daily). The body is a funny thing, I tell ya. But it's interesting to learn all about it and figure out how to troubleshoot, figuring out cause and effect, and all that good stuff. All that said, I am on the bench for the time being. And you know what? I'm okay with that...for now. Other than this whole pulled muscle thing, I feel completely recovered from Rocky Raccoon, which is very promising. I feel good. And when I can run again, I'll be ready. Right now, I'm thinking of passing on any shorter races in the interim (except for Minnesota Voyageur 50M), and really focusing on Leadville. I love the 100 mile distance, it's so ridiculously rewarding. But, we'll see. Once I'm running again I may be really race-happy! For now, one day at a time, taking it all in stride. sorry about the injured "pop". I have never pulled it, but have strained them on the back of either knee at times. I happily use mine as my caution you have done to manny miles in short amount of time warning light. After 5-7 days rest I can run again. good luck on the girls scout cookies. have fun. Interesting, I've never heard of that injury before. Hope it heals up quick! Hi Paige! Thanks for stopping by our blog! You ultra runners are awesome! Unfortunately, I don't think I have the desire nor attention span to do a trail ultra - Steve could do it, though. Great job on Rocky Racoon - you should feel proud. It will be fun watching your training for Leadville. Hope you heal up quickly - it's frustrating to be sidelined when you have a big event on the horizon.